Virtual reality (VR) was once only the realm of science fiction. The ability to immerse oneself in a realistic virtual world existed purely as a fantasy. Many books and movies have asked the question: What if we had the option to experience anything we could imagine without the limitations of physical reality? The answers were sometimes silly, sometimes frightening, and always fictional. In reality, early VR systems were crude and performed only very specific tasks. MIT created one of the earliest VR systems, the Aspen Movie Map, in 1977. The Aspen Movie Map allowed users to walk virtually through Aspen, Colorado, in different seasons. While this was novel, it wasn’t made for consumer use, and it didn’t have a broad application. Even later systems with more functionality encountered problems. In the 1990s, a VR system designed by Sega seemed to be on the brink of major success. It was quickly abandoned however, due largely to the fact that it caused users to experience profound motion sickness. The problem was the result of shortcomings in technology, which didn’t allow graphics to keep pace with users’ head movements. For some time, VR systems appeared to be out of consumer reach. Augmented reality (AR) has been more accessible than VR in recent years. AR is a combination of real-life input, such as pictures and sound, as well as virtually generated elements. The result is, as the name suggests, an augmented version of the real world. A recent example of AR technology was Google Glass, a headset that allowed users to see information projected directly in front of the eyes. Although Google discontinued the original Google Glass, a new version is in the works; these glasses fold, the viewing screen is longer, and the camera will light up green when it is on, allowing people to know when they’re being filmed. In the VR world, new technology that allows onscreen graphics to refresh rapidly has all but eliminated the problem of motion sickness for VR systems. With the advent of several VR systems for the consumer market, the fantasy of accessible VR is becoming reality. The upcoming releases of the PlayStation VR and the Oculus Rift signal a new age for VR – the two consumer-oriented VR systems slated for release later this year, and there’s a lot of buzz in gaming communities. These state-of-the-art systems will allow for 360-degree visual and audio immersive VR experiences. Multi-player VR games will allow players to essentially experience the same place and time together, adding a new dimension to multi-player gaming. Although VR movies are not yet readily available, watching movies in VR is one of the highly touted functions of these systems and will likely roll out as the next phase. Although VR is certainly making waves in the entertainment industry, it has many other applications. It can be extremely helpful in training and education, as newbies can get “hands-on” experience in high-stakes activities without worrying about the consequences. The medical field is poised to make great use of VR technology, allowing doctors to practice difficult procedures multiple times before working with real people. Medicine isn’t the only field ready for VR technology. Urban Designers, Civil Engineers, and Architects are using VR to experience and troubleshoot their designs in a four-dimensional environment. In the field of mental health, VR has therapeutic applications, such as helping people overcome phobias by exposing them to a virtual version of the source of their fear. VR can also be used in the treatment of mental issues such as depression and anxiety. According to the Economist Intelligence Unit, 26% of senior marketers believe that virtual reality will have the biggest impact on marketing by 2020. For marketers, AR/VR technology means a whole new (virtual) world of marketing options. One of the best ways to make your brand come alive is to tell a story and new VR systems will allow users to participate in an immersive story that includes sight, sound, and as VR touch technology becomes more widely available, sensation. These developments bode well for marketers as they create with VR and AR technology. Using AR to connect with customers – Smartphone and tablet apps have made it possible for any user to experience augmented reality, and many marketers are using AR to great advantage. In retail, several apps allow users to virtually “try before they buy,” which is especially helpful for online buyers. Using AR for ecommerce can lower the incidence of customer returns and increase customer engagement. The Sayduck Furniture Visualizer is an excellent example of how AR can help market retail products. 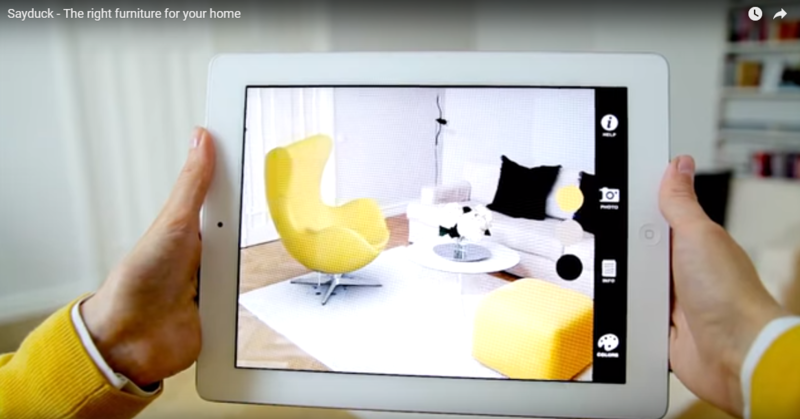 The furniture visualizer allows users to place a piece of furniture in their own homes virtually. They can see how the piece will coordinate with existing décor and how the dimensions will work in a given space. Customers can feel more comfortable that they’re making the right purchase. Because this app is risk-free, they may even be convinced to try an item they wouldn’t have ordinarily considered. Increasing site traffic by offering VR options – VR options are widely popular. Offering a VR experience on a website can drive a huge increase in site traffic. Consider the example of Disney’s Star Wars 360 VR experience, which was viewed 6.6 million times. 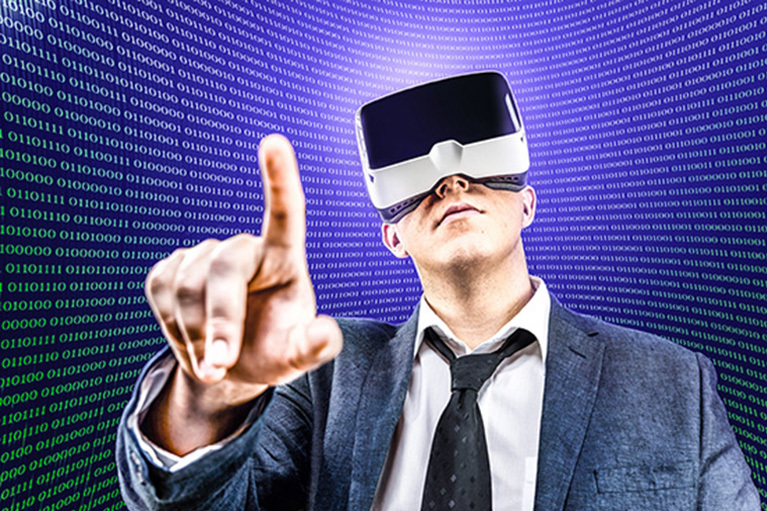 Creating immersive marketing experiences – Systems like the Oculus Rift and PlayStation VR can create immersive marketing experiences, which are changing the face of marketing. Immersive VR systems will allow for 360-degree brand experiences. Several brands have already begun testing this option. British fashion retailer Topshop used the Oculus Rift to allow customers to attend the London Fashion Week virtually, although the event itself was not accessible to those outside the fashion industry. The hotel giant Marriott used the Oculus Rift to create a virtual travel experience for customers and has been toying with the idea of putting VR systems in hotel rooms to appeal to Millennial travelers. Zumba created a VR exercise video to allow users to participate in – or teach – a Zumba class. The North Face cleverly used VR to create outdoors experiences. Customers could rock climb, hike, and parachute in the VR system. The purpose was to engage customer enthusiasm about the outdoors and then set them loose in a store full of outdoor equipment. Educational institutions have begun taking advantage of these systems as they market themselves to potential students. In a savvy marketing campaign, Savannah College of Art and Design (SCAD) sent VR headsets to accepted but unenrolled students to allow them to experience SCAD’s campus more fully. VR will also provide increased capacity for remote collaboration and enhance customer engagement and services. Customer service will be able to become a truly personal experience when users are able to interact virtually with a real customer service representative. 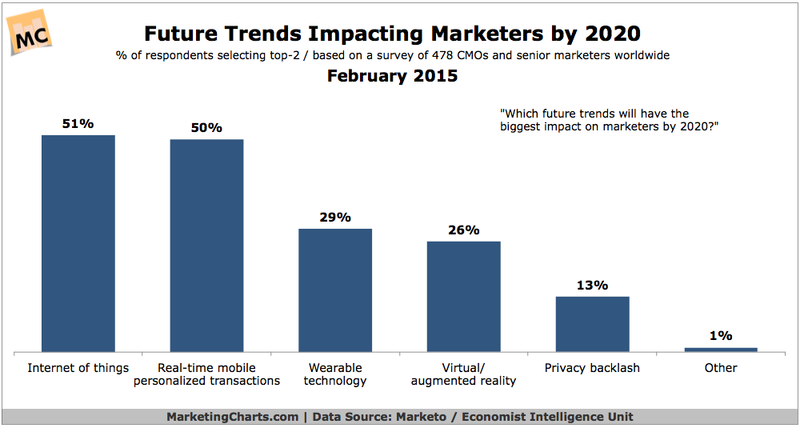 As VR systems become more widely available to consumers, marketing applications will explode. The possibility of telling a fully immersive story about a brand will enable marketers to connect with people in a whole new way.